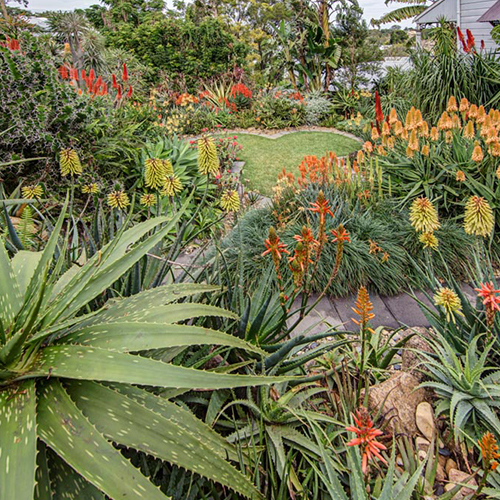 Gardening with Aloe-Aloe’s has been described as “easy gardening” as in general, relative to other garden plants they require very little care- need little water, seldom produce any leaf litter, rarely need pruning or shaping and not require lifting and splitting. Whilst some have said “they will survive in concrete” we believe they do benefit from some love and attention to ensure they look good all year round and deliver the flowers of the magnitude they are capable of. Aloe-Aloe hybrids store water in their leaves and can withstand very dry conditions, and if receiving no rain for say 6 months, they are not likely to die. 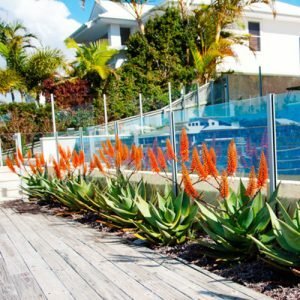 If the plants are well established, the leaves often discolour from stress in this situation- to many this discolouration makes the aloes look more attractive. The leaves can curl up; however they will unfold again when the plants receive water again. However during the hot summer months they will thrive and flower much better if they receive good water, particularly in the summer growing season when they prefer generous water. This could be a monthly soaking with a garden sprinkler or even weekly if very hot and dry. In winter, their resting phase, they are dormant and do not grow. At this time they need only sufficient water so that their ground soil does not dry out completely. However if grown in Autralian regions receiving winter rainfall (eg Victoria, South Australia, Tasmania and Western Australia) they are able to cope with increased water over this period. 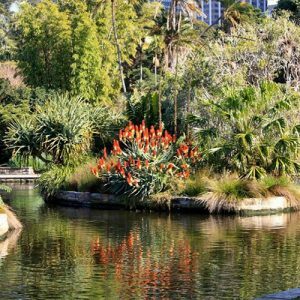 Obviously smaller aloes are less able to store water in their leaves than are large ones and consequently they prefer more regular water. When the rains come they flourish as they simply take a big gulp and fill up their roots and leaves enabling them to survive until the next rain. Plants in containers are less able to cope and should be given enough water to maintain some moisture in the container, but never when moist soil can be seen or detected by a little finger digging. As a general rule, the smaller the hybrid, the more often it will require watering. The very small pot plant sized aloes need some moisture where the roots are concentrated at all times. 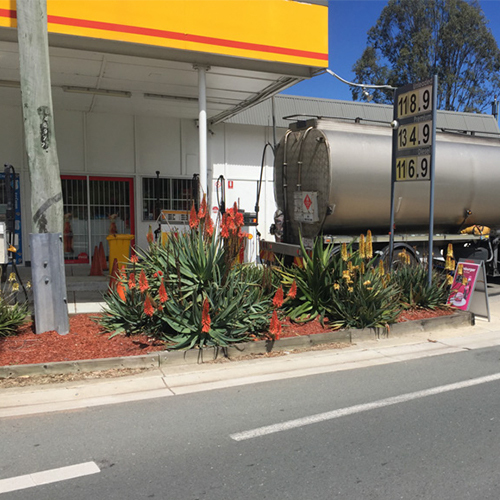 Watering periods will differ depending on the growing medium, the size and the location of the container, but they will probably need water at least once a week in the summer. Whilst Aloe-Aloe’s are able to tolerate poor soils, adequate nutrition will assist the plant in remaining healthy, particularly if there are extreme conditions like a sand belt. 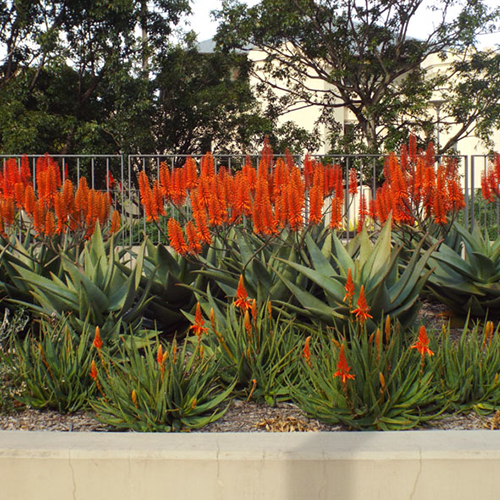 In general Aloe-Aloe’s perform well in soil containing decomposed organic material (humus) and in particular flowering aloe hybrids are hungry feeders. Just as a superior athlete will not die if he eats poor food, he will not excel athletically. 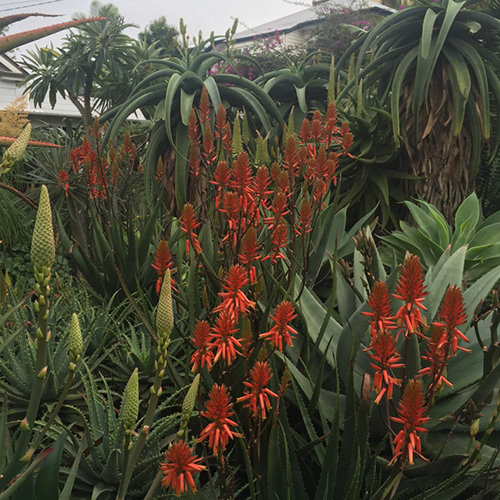 So too this hybrid Aloe-Aloe’s (like the elite athlete) need good food to enable the spectacular flower performance they are capable of. Well-rotted cow manure is excellent compost for aloes and we recommend it be applied as a top dressing in spring. The form of Aloe-Aloe’s vary considerably, some being significant ‘clumpers’(e.g. Bush Baby Yellow™) which shoot prolifically like a “ground cover , others being single stemming (like a palm tree e.g. Bottlebrush™) with no shooting (or pups) and others falling somewhere between these extremes. This is nature at work and any decision on whether or not to remove stem shoots is a personal one. However we recommend that the following be considered: 1. Allowing stem shoots to develop will change the appearance of the plant to a bushy or shrubby shape. It may initially inhibit (but not stop) flowering, but can ultimately improve flowering performance as every rosette will now be producing inflorescences. 2. Stem shoots can be targeted by pests and diseases because these can be difficult to detect or easily overlooked where shoots are forming. The softer plant tissue of a small shoot is also more vulnerable to attack. Also, they are closer to where ants and aphids normally operate. Before cutting shoots, ensure that the plant is dry and will remain so for 2 or 3 days. Water plants in pots 24 hours before cutting. If the shoots have developed on the stem (trunk) of the aloe, simply cut them with a sharp secateur or knife. If they start showing from under a stem less or sitting plant, scrape away the soil underneath the shoot(s) to enable you to cut as close to the main plant as you can. A carpet knife blade or scalpel is useful for this but take care damage other parts of the plant or yourself. 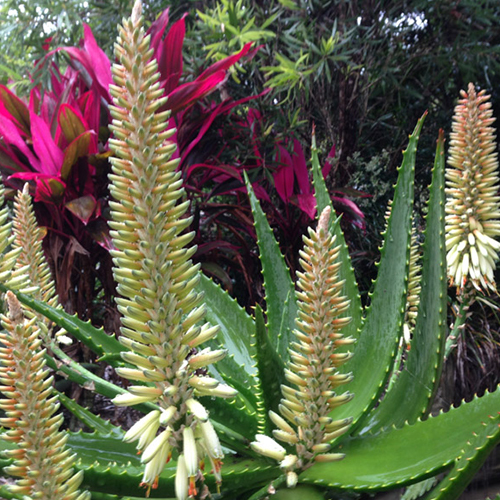 Aloe-Aloes, like all other plants are living and growing things. Over time the plant (particularly the tree aloes like Erik the Red™) can becomes too tall and/or top heavy to remain upright. The first warning signs may be a plant that is starting to lean over. Normally soaking rains lead to the roots losing their grip in the soil and the whole plant falls over. This is what happen in an aloe’s native habitat in Africa and would happen to plants like Cordylines in their native habitat. Rejuvenation calls for the aloe stem to be severed with a clean cut. Provided some stem tissue is left intact under the rosette, as much of the existing stem can be left as desired. We recommend leaving just enough for new root formation because the plant can then be placed in its new (or same) location without the need for supporting stakes (with a very short stem the bottom leaves can support the rosette, much like a stem less aloe). The remaining stem and root ball should then be discarded, as it will not grow without any leaves. It is important that, after the cutting, the plant is placed in an upright position, on a brick or stone, against a wall or rock where it will get a few hours of sunlight every day. In habitat spent leaves on aloe species sometimes fall off but often remain on the plant and stems are covered with old dry leaves. In the garden the same process takes place but for aesthetic reasons many gardeners chose to cut off and remove old brown leaves in the same way as they would remove a spent palm leaf. In habitat aloes produce some flowers(although not always significant nor for very long), which fall and rot when spent. 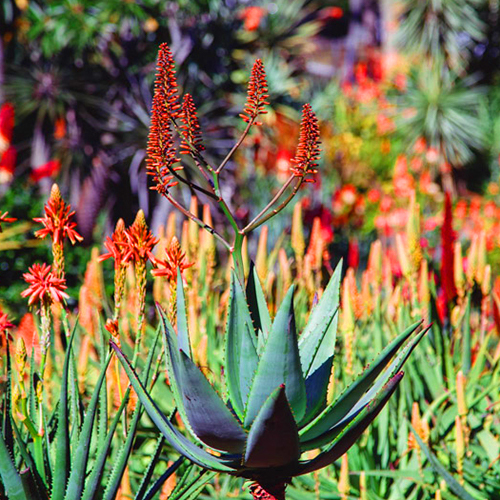 Aloe-Aloes are prolific flower producers providing significantly more flowers for longer periods than pure aloe species. Because of this, spent flowers fall in the rosette and if there is no rain to wash them out, this can encourage insect activity. Whilst we recommend removal of spent flower stalks for aesthetic reasons only, it is not necessary. However if there is little rain following a period of intense flowering, the plant will benefit from removal of the spent flowers, manually or with water from a hose pipe under pressure. During wet weather loose soil can fail to provide a grip for the roots and a large Aloe’s-Aloe’s can start leaning over, particularly if tall large specimens are newly planted. In this instance the soil around the plant should be rewet thoroughly and the plant pushed back straight. Wedging a flat stake under the rosette can then support it. Two of the real baddies in Africa is the snout beetle and gall mite (or aloe cancer) Aloe Cancer is widespread in the USA, but fortunately neither of these are in Australia. Aloe-Aloe cultivars are all derived from genetically superior plants with “hybrid vigor” so they are generally stronger and much better able to cope with pests and disease than most pure aloe species. However the best defence against disease is a healthy Aloe-Aloe receiving good sunlight, sufficient water and good nutrition. Healthy plants growing in ideal conditions will be less likely to become diseased. The same way we are less likely to catch a cold if we are healthy. Healthy plants are also less likely to be adversely affected by insect damage. If a few insects land on healthy plants, the plants are likely to shrug off the damage and keep on growing and flowering. If unhealthy plants are munched on by insects, the plants have less energy to deal with the invading pest and will be more adversely affected. Click here for identification and treatment of pests and diseases.